We had a relaxing morning in the boat before we started to go with engine towards fjallbacka archipelago. I showed Agnes Kyrkogårdsön before we went to Gluppöbassängen were we Achored and had lunch. It was not that many boats but the sxk boj was occupied. After lunch we sailed towards Grebbestad. We got a nice place to dock which Agnes did very well. After i while four gentlemen Cameron forward to the boat and Said we had a nice boat. I had seen US in gluppöbassängen earlier that day. We inviter them into the boat and when coming on board they introduced them self. One was Pelle P !!! I Said to Agnes, who were fully Dressed up with Pelle P clouds, who he was as Agnes did not regognize him. The four gentlemen had an awarage agenda of 81 in their boat maxi 1300 (of course:-)) They went from Harbour to Harbour for playing golf. In the evening Agnes and I went biking (sportshopen was closed) and to the fishstore to buy prawns as Julia Steffner should arrive. We bought 1.5 kg (using Anna as reference) but when we eat them Agnes are 7 prawns and me and Julia not that much. We had much left over. Reine came a while for at chat. Shortly after we went to bed. We woke up to a beautiful day. I had a Volvo audio conference in the morning while Agnes was sleeping. By the time Agnes woke up the conference was ready so we could have a joint breakfast. 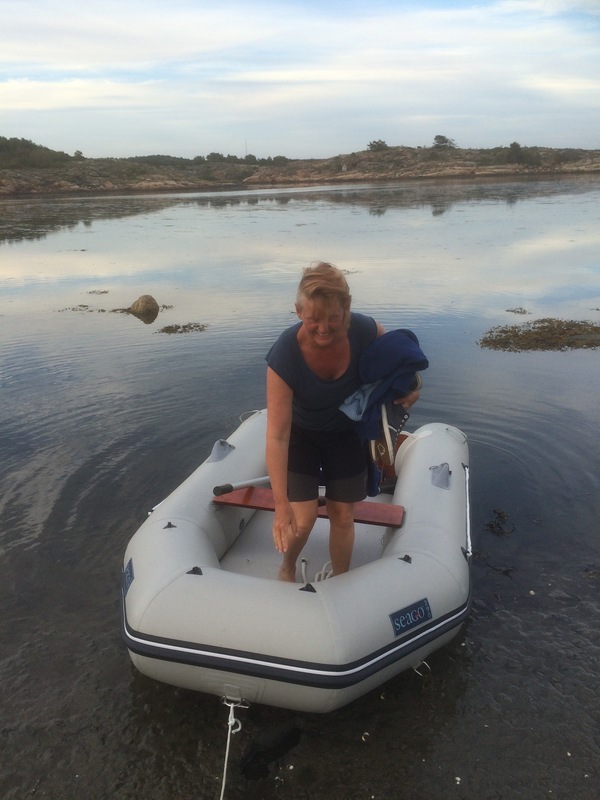 We decided to take course towards Väderöarna and hoped to get room for our boat. We had a very nice sailing all the way and lucky for us when arriving the harbor captain directed us towards pier that was empty. Surprising to us as the clock was 14.00. Agnes docked the boat perfectly. The afternoon was spent in the cockpit relaxing. Agnes slept for 2-3 hours in the sun. She really needs to relax. When she woke up we took a walk up to the lotsutkik and got a presentation of the history before we went up into the utkik. Thereafter we walk cross the island to stromsund and back. Evening was spent in the boat reading and practicing knots. As we got the message that Agnes will join during the day Anna decided to drive back home to prepare for the Malmo event. While waiting for Agnes I continued preparing the place in the harbour by preparing lines. When Agnes joint at lunchtime we had a joint lunch before Anna left with the car and I and Agnes started to sail north, west of Malmon and thereafter via kungshamn, soten to hunnebostrand. We docked with the stern towards the pier with great help from neighbour boats. We relaxed for a while and decided to buy pizza for dinner. Agnes was tired and went to bed very early – she really needed that. We had our breakfast and thereafter said goodbye to Hans and Christel. As they had decided to go by engine directly towards Grundsund and as we planned to make a short stop at bovalstrand we decided to say goodbye. We went in shore by engine but realized after a while that a stop at bovalstrand would cause as a big delay and we therefore decided to go straight to basteviksholmarna. After arrival I took the car and drove to uddevalla to buy fenders, new radio, new engine and ropes before returning back. I started to prepare our pace at the harbour and Anna went to the grocessery shop. A perfect start of the day. We had a good breakfast in the cockpit except for Anna who had her breakfast in the bed as usual :-). We managed to cast of perfectly. A spring and bow thruster managed to turn out the boat perfectly. We continued south after a while. We set sail a started to meet the sea waves towards vacker light house. Hans and Christer who was before us decided to change course to sail the inshore course towards Grebbestad and getteron so we we rolled them even if our boat behaived very well in the rough sea. We ended up at getryggen were we found a good place a long side the rock. The afternoon was very nice. Anna was baithing …. and we all were relaxing. 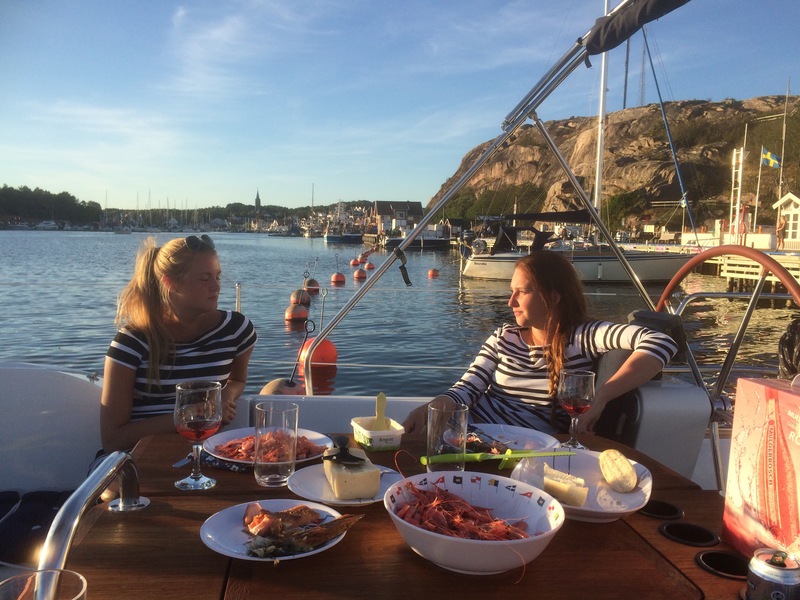 In the evening we had a barbeque in the boat and finished up the evening with playing …. Guess who won …..
We had an late breakfast before depaturing towards Ramso. We went west of Ramso in pretty rough sea and turned east towards the harbour. When entering the harbour it was a bit crowded as the harbour is very small. We could not find a place so we decided to leave but when going out of the harbour a guy in a motorboat said he was leaving so we good take is place. Unfortunately that place belonged to the taxi boat and as there was a wedding on the island we good not stay long on that place. We stopped anyway to find out if more boats were suppose to leave and so it was. We started to help boats to leave so we could support Hans and Chistel to get a parking a along side the pier. We thereafter moved our boat to dock a long side the Vindo. It went perfect even if it was not much room for our boat but as everyone was helping we got a perfect spot. We got a couple of boat docking outside our boat but it went also good. The boat outside ours did not have any water so we gave the a couple of liters and when they were suppose to pay harbour fee that did not have any cash so we gave the 100kr which them swich back to me. They were nice guys. In the afternoon we took a walk to the beautiful beach and to the nackros dam. It was a nice walk in the sun. The evening was spend with a joint dinner in our boat. We got the message that our friends Hans and Christel should join us with their Vindo 45 during the day we decided to use our bikes to Havstensund rather than the rubber boat for buying some food for the dinner. We did not do anything the rest of the afternoon until they came at 17.30. It was nice to meet them again as this was the first time this summer. We prepared food together and had a nice evening. Sunny day with 2ms wind. We relaxed in the boat for a while discussing were to sail. Before we cast off we walked to Reine and Kia to say goodbye and look in their renovated apartment. Very nice – as suspected. We set sail north towards havstenssund and when sailing Reine and Kia came with their motorboat. They took some photos before they continued towards Ramso to meet some friends. Anna and I tried to find a place nw of havstenssund where you can find SXK boj or to lay a long side the cliffs. Unfortunately we missed one boy for another boat so we decided to go into Sannasfjorden where we find a place where we have been laying before together with Hans and Christel. I spend the afternoon reading Anna’s work to give some feedback on the structure. Later in the afternoon we put the rubber boat into the sea and We started to row towards havstenssund following the inner bays. Interesting journey and we ended up on the east side of Havstenssund where we was forced to walk in mud. Anna was not really pleased…..
We cleaned the feets in the harbour before going to the restaurant for a prawn sandwich, beer and an Irish admiring the view. We rowed back the same way when it started to be a bit dark. We had a very rainy night but not much wind so we could sleep very well at our boj. I woke up when a motorboat was speeding close by our boat and I thought it might be the boat selling bread. I run up but the boat had already driven to far away 😦 We had a good breakfast any way. We cast off at approx 11.00 and start sailing north. We went directly towards Grebbestad in good wind 8 ms from SW so we had free wind and good speed. In Grebbestad we dock alongside the pier outside harbour Office and waited for Thomas, Ulf and Jack to arrive as Johan was suppose to leave back home. We had a cup of coffea together before they left. Anna and I met Kia on the pier when that were going towards a restaurant. We decided to order a pizza and eat in the boat. Kia and Reine came back later so we spend some hour talking to pick up what has happend since we last met. A very nice evening.